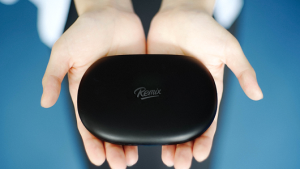 The Remix Mini emerges as the result of a crowdfunding campaign, orchestrated by three ex-google employees. It comes under the form of a tiny rounded Android on PC appliance, promising to fulfill all common tasks you may need to accomplish on your standard PC. These facts by themselves are not that exciting… What makes the Remix Mini that much special is a price tag of 30 USD and the carefully tailored Android OS version running inside it. The Remix Mini comes with Remix OS, a modified Android OS which includes several enhancements allowing this mini PC to behave more closely as a “normal” computer. For a start, it allows you to run several apps, inside different windows, like a normal desktop OS would do. Also remember that Microsoft extended their Microsoft Office tools into Android OS. So for everyday office work, web navigation, remote desktop tasks, multimedia sessions -watch movies, listen to music- and even some mild gaming, the Remix Mini seems to be ok. The Remix Mini includes the usual network connectivity options, like WIFI, ethernet and Bluetooth. It also comes with standard Headphones, USB and HDMI ports. THe HDMI output is 4K capable. On RAM and storage, there are two versions available: One with 1gb RAM and 8gb of storage, and the second one doubling those metrics. On the processing side, it includes a 64bit chipset which is 20% – 30% faster than 32bit older chipsets. The main processor is a 1.2Ghz quad core Allwinner A53. The graphics co-processor includes H.265 hardware decoding, ideal for that 4K HDMI output. After writing this, I am actually looking forward to purchasing a Remix Mini for myself !